Today I unexpectedly discovered all of the Wall Street Journal’s Twitter lists. Won’t setting these all up via RSS to be fed into my Google Reader and iGoogle account excite Mr. Murdoch even further? Scanning all of the Wall Street Journal feeds (and now their listees) in one homogeneous format like an iGoogle page should make identifying the articles I would like to read much easier than trying to visually strip out all of the extraneous information that usually occupies the Wall Street Journal’s homepage. 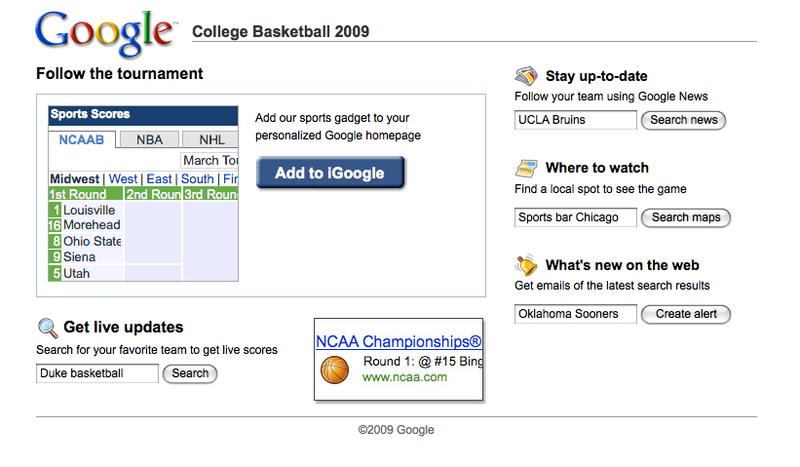 iGoogle users can now add a Sports Score Gadget to their Google home page. 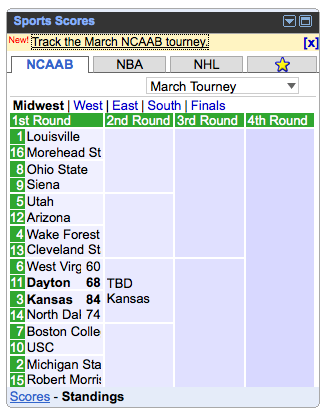 With the iGoogle Sports Score gadget, internet savvy sports fans can get real time scores and standings by league, conference or tournament as well upcoming match-ups and game times. 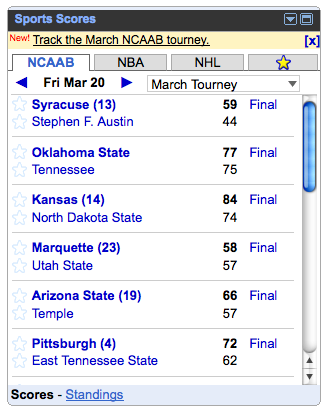 The sports score gadget is seasonal and presently features: the NCAA & the NCAA Tournament, the NBA and the NHL. With the iGoogle Sports Score gadget, Google account holders will be able to view all their favorite teams and scores in one place within their browser. 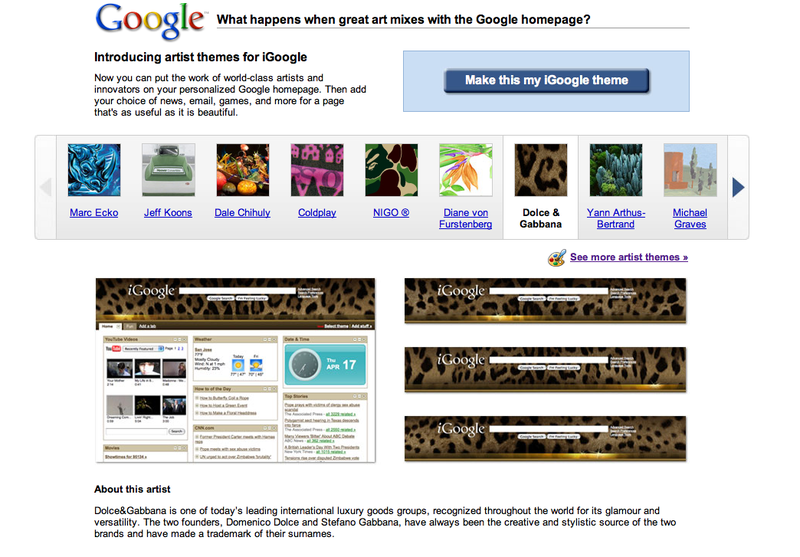 iGoogle has added a new batch of custom themes for iGoogle user’s called “Themes for Causes”. There are 25 different iGoogle Themes for Causes available at this time. Some of the more popular iGoogle Themes for Causes are those from the World Wildlife Federation, Alliance for Climate Protection, the Rainforest Action Network and Clean Air-Cool Planet. Surely there will be more Cause related themes added to the list of iGoogle theme options as other causes become aware of the branding opportunity iGoogle offers cause related brands to further reach and connect with their respective audiences. Over the last week, I began using the inline view feature in iGoogle to scan RSS articles without having to click through to the source site. I prefer gathering, viewing and reading web site content through iGoogle over Google Reader because I can see hundreds of articles at a time and decide which ones I want to read. By clicking the inline viewing feature within the feed box, I can read the entire article within my browser without leaving my aggregated feeds page. Recently I noticed my Wall Street Journal Media and Marketing feeds have been accompanied by display ads from Google Analytics. 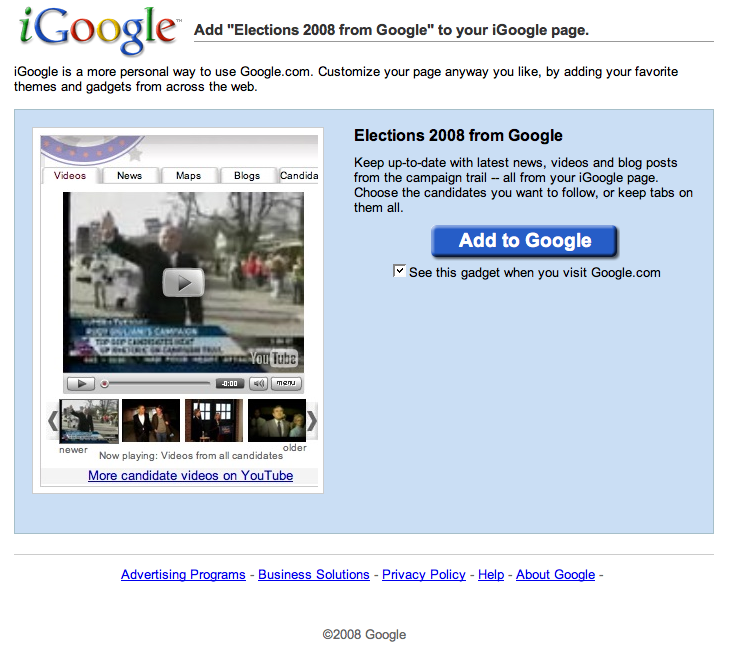 Pushing display ads through iGoogle feeds is innovative. However after having clicked through to the Wall Street Journal site to see the display ad, I wasn’t able to find it. 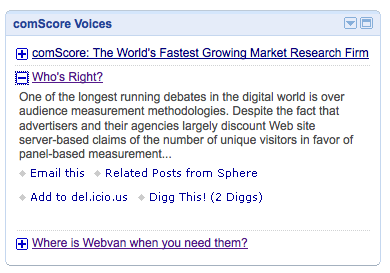 Few if any of my other RSS feeds are getting their site’s display ads pushed through my iGoogle feed. Why Aren’t Google Blog Search Categories Available via RSS? 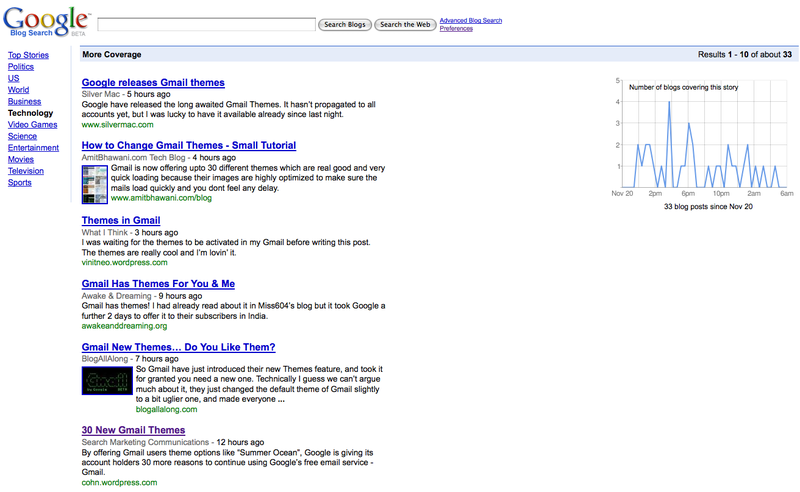 Google recently made some changes in how it displayed blog search results. 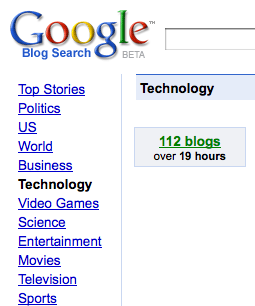 Google Blog Search Beta now offers 12 categories of blog types to choose from. The blog categories are: Top Stories, Politics, US, World, Business, Technology, Video Games, Science, Entertainment, Movies, Television and Sports. By drilling down into blog categories further, searchers can now find specific topic coverage by different blogs from within each category. A topic and its position within the Google Blog Search page results along with the featured blog source are indiscriminately selected according to Google. As luck would have it, yesterday I noticed a large number of referrals coming from Google Blog Search which prompted my visiting their site. I was surprised to find this blog – “Search Marketing Communications” listed atop the list of Google Technology Blogs sources. My blog remained atop their list along with the topic for a short while before then being displaced by an ongoing stream of technology related stories and other blogs. Upon clicking on the “all 37 blogs” link, I then found my blog still displayed in the “More Coverage” list of all the blogs Google had scanned that had recently written about the same subject. Google Blog Search Beta’s grouping blogs by subject and then offering them via blog search results should give both bloggers and Google greater reach. To extend both bloggers and Google Blog Search reach further why doesn’t Google offer RSS feeds of their Blog Search categories via iGoogle and Google Reader? If Google did offer Google Blog Search Beta categories via RSS, I would subscribe to several categories. 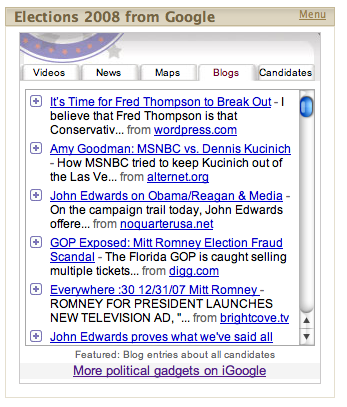 The most recent update of iGoogle features a button for each post published through RSS feeds. I just noticed the (+) button next to the RSS feeds I subscribe to, but hadn’t actually clicked on one until today. Clicking the (+) button pulls some or all of the story into your browser so you don’t have to leave the browser frame to review and read individual posts. If the entire story isn’t displayed and you still want to see more of it, then click through to be taken to the RSS source site. Otherwise, enjoy consuming the same amount of information while conserving keystrokes at the same time with iGoogle’s new RSS viewer feature. This new RSS button may have already been in iGoogle for some time. If it has, then I guess my particular case of iGoogle button blindness has now been cured. Search for the Earth Day word that isn’t really one from the following list of 21 iGoogle tab themes. 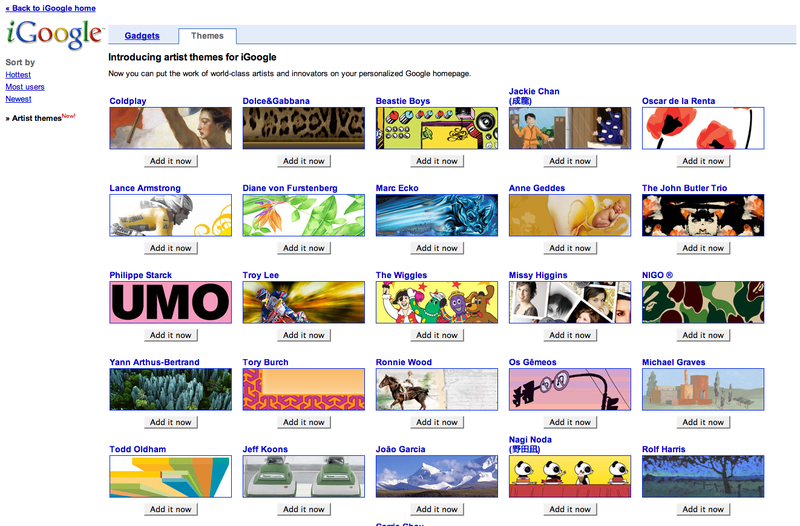 Google offers custom Google page themes for iGoogle account holders. After you have established your iGoogle account, you will see your home page tab followed by “Add a tab” and then to the far right “Select theme” and “Add stuff” links. Click on the “Select theme” link and you will be taken to directory of Google themes for use as images within your iGoogle tabs. You can search for word specific themes or drill down through their list a page at a time. I have searched through the majority of iGoogle page theme options to produce the following selection of 21 Earth Day related images and words for use in your iGoogle tabs. To keep things interesting, I have slipped in one image and word that under most circumstances wouldn’t qualify as an Earth Day related term. See if you can figure out which one word and image aren’t even remotely related to Earth Day and submit your answer in the “Leave a reply” section of the post.